Umbrellas have come a long way since the first scraps of material arranged to keep the rain off – and nowadays, they have evolved into the elegantly designed multi-spindled construction we’re so familiar with…and, well, bored with. Isn’t it about time umbrellas became fun again? From the best in pugilistic umbrella-mayhem to the sweetest way to woo a loved one, these 15 examples are guaranteed to chase the clouds away. The rain is scything down, and let’s face it, your umbrella isn’t going to help much. It’s not about keeping dry: it’s about keeping your temper. And what better way to do that by taking out your frustrations in a sneaky water-fight against your companions? 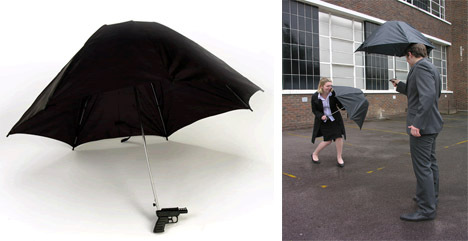 The Water Pistol Umbrella only works when it’s raining, by catching the falling water in the top of the umbrella and feeding it down the shaft into the handle-mounted pistol. 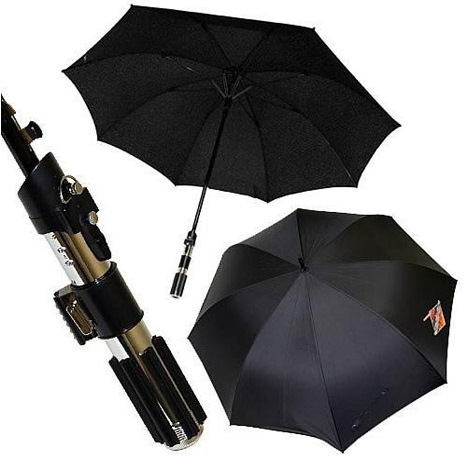 And if your target returns fire (as above) – the umbrella doubles as a shield! Eat my rain. Here’s one not to take round Japan (unless you’re fond of being rugby-tackled by policemen). 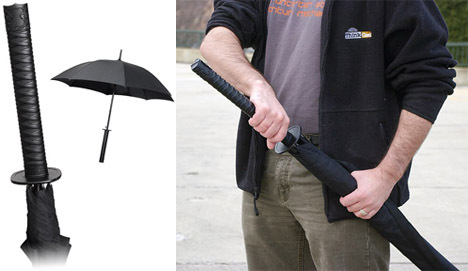 This Samurai Sword Handle Umbrella looks worryingly ready for business – for extra effect, it even has a nylon sheath you can draw it from…which would look even better when strapped to your back. Unsurprisingly, reactions to this product have got a little out of hand. Oh dear. (It’s an umbrella, dude). Continuing the theme of umbrellas that have people crossing the street to avoid you, we have Yoel Mazur’s Self Defence Umbrella. Cunning designed to look less assembled than whittled & hacked, this mean-looking lump of wood affixed with sword-like blades also opens out to become a half-umbrella. Even the rain will feel intimidated. But when it comes to raw, hair-raising formidability, the kingpin of umbrellas has to be the Unbreakable Walking-Stick Umbrella. It is used by the bodyguards of the president of the Philippines – because not only does it keep the rain off nicely, it’s strong enough to support your weight, will take any amount of battering – and can split a watermelon in half with one blow. Maybe best left to the professionals, this one. …but this one does! While not official Star Wars canon (the comments at Crunchgear point to something similar being seen in Ridley Scott’s Blade Runner), the glowing centre-poles of this umbrella definitely evokes A Galaxy Far, Far Away. Yes, practical – but oh-so-terribly geeky. If you regularly use your rain-shield in the big city, you’ll know how annoying it is when you’re always catching the sides of your umbrella on other things (such as other umbrellas). The Polite Umbrella – which had to have been invented by a Brit or a Canadian – makes room for the intruding personal space of others by drawing its arms in and hunkering down. A bonus? When it gets windy enough to threaten turning your brolly inside-out, this is the idea way to fight back! But enough of fighting. Can’t we all just be friends? 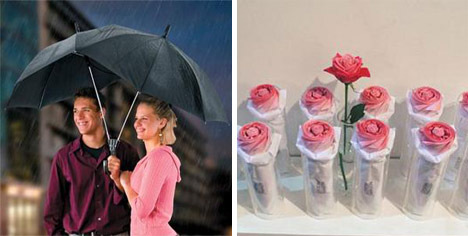 The Double Umbrella works like a tandem bike, by bringing people closer together – and if love blossoms, what better way to offer up your affections than with a Rose Umbrella? (Watering unnecessary, but inevitable). We have developed a special branch of furniture to deal with umbrellas, hats and coats – but if you prefer a more unobtrusive place to store your brolly, how about in the wine-rack? 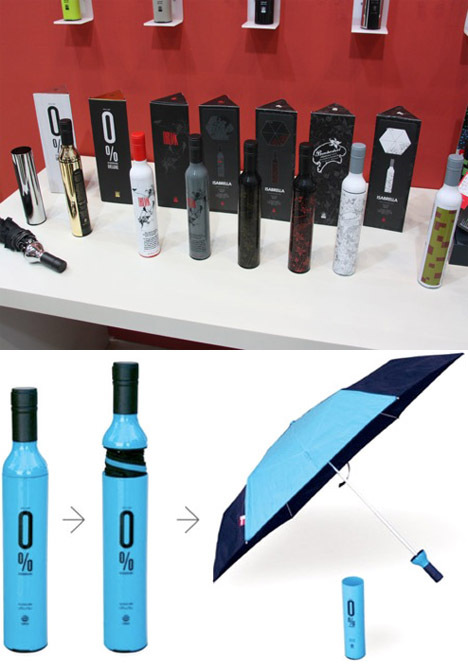 The Is.A.Brella Wine-Bottle Umbrella uncorks, sorry, unfurls from the depths of a cannister shaped exactly like a bottle of plonk (albeit one in a more livid color than you’re used to, so there’s no mistaking it when you’re rushing out the door). When the wind starts to howl, umbrellas become a problem. Rain? Perfectly shaped. Wind? 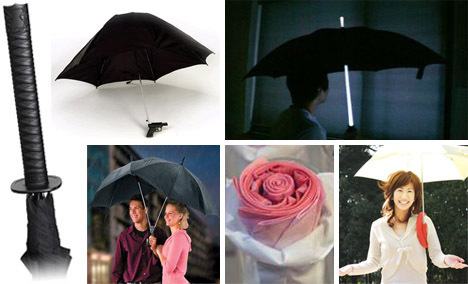 Perfectly-shaped to trap it, yes – and there’s nothing like an umbrella for dislocating your arms in a gale, or exploding inside-out. 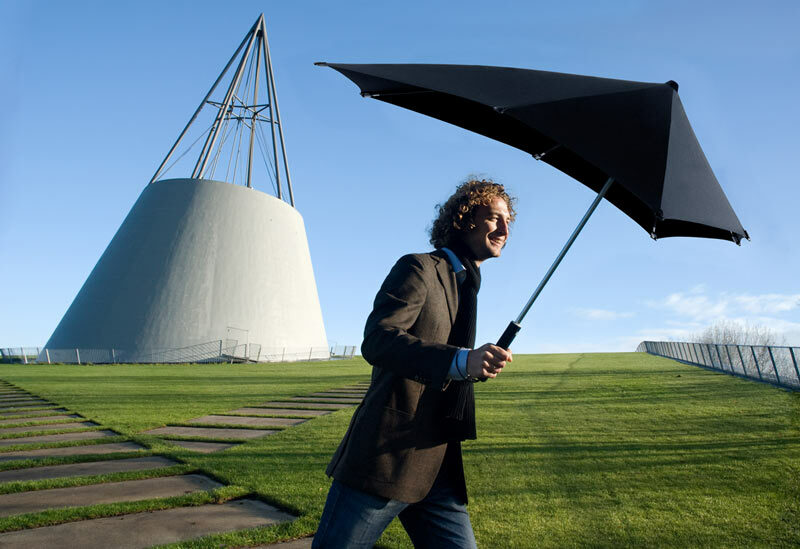 Since the shape is the problem, the clever people at Senz have gone back to the drawing-board and made a brolly that tackles the wind aerodynamically. They claim their umbrellas will never invert, and are safe at windspeeds up to 60mph – at which point we say, what lunatic goes out in a tropical storm holding an umbrella? 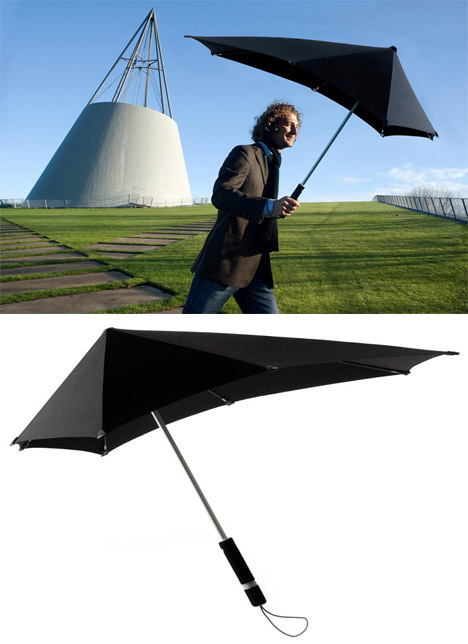 Also handy for those moments when the wind gets a grip is the Burera Coiling Umbrella Handle. It wraps itself around your arm, your leg or any other appendage you might chose (careful how you go), and stays fixes in shape in the same way as a pipe-cleaner. 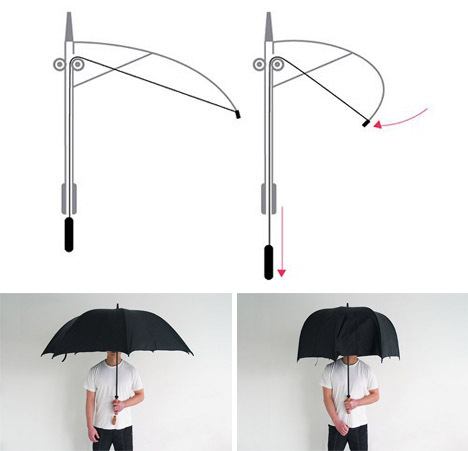 A hands-free umbrella – who woulda thunk? 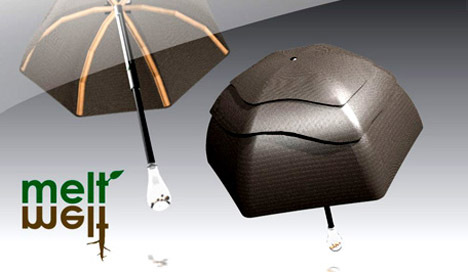 And how about an umbrella that recycles as you go? The Eco Brolly is nothing but the frame – and you provide the material to stretch between the tines, using litter! Plastic seems ideal. Newspapers? Well, not so much, despite the example used above. 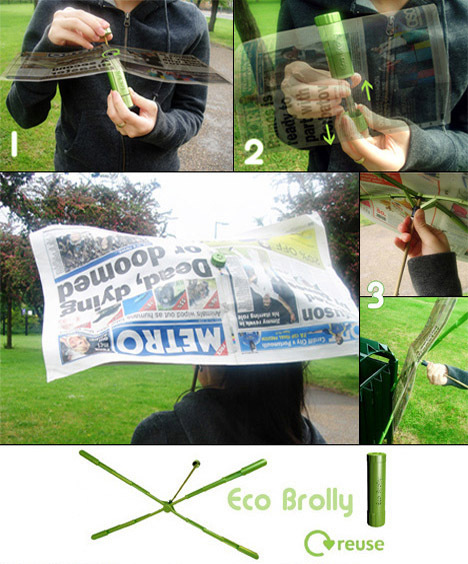 Setting another good, green example is the Melt Umbrella: it springs open with the help of cylindrical pieces that automatically snap together (that’s not the eco-friendly bit), and once it reaches the end of its days, the whole unit can be safely buried – its biodegradable garden film and bamboo will “melt” back into the ground. There are even plant seeds embedded in the handle, waiting for the right moment to become a corner of your garden. 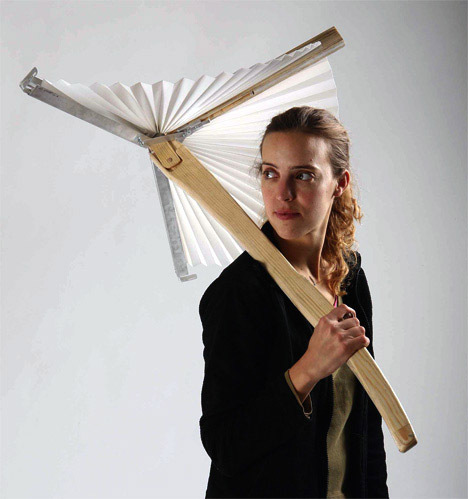 Last and certainly not least – a brolly that generates clean energy. 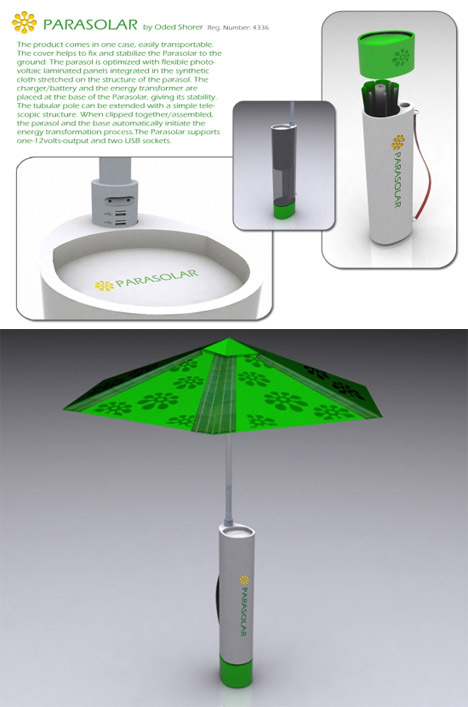 The Parasolar mops up solar energy during the daytime (from being either propped up in the sunshine or used as a parasol), and when night comes, you’re keeping the rain off with a big green gadget-powering battery. If you’re one for walking for hours with your mp3 player blaring away, you don’t have to let weather or power capacity limitations get in the way. However, we have an even better idea for v2: catching the sun is clever, but why not harvest the rain as well?